Finally we pulled our socks up and caught the bus bound for KL. After a good 15 hours we arrived. 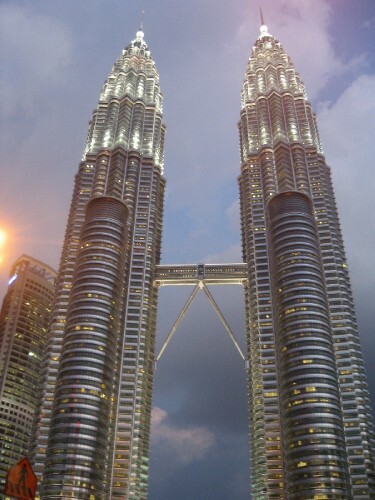 KL is majestic to drive into, the towering metropolis is epic when seen for the first time at night. We stayed in Chinatown which is also pretty cool to arrive into at night with bright red and yellow lanterns everywhere. Unfortunately our hostel was above a bar, but you get what you pay for and it was nice and cheap! Plus the AC leaked all over Josh hahaha. Northbound for Geroge town this morning as we headed for the island of Penang. The journey took a couple of hours but we enjoyed exploring the old part of the city through the afternoon. Very chilled and relaxed atmosphere here. Malaysian multi-culturalism is definitely a good thing for us - had a really good tandoori thali for lunch and an even better curry for dinner. Saying 'danyabad' (my spelling) and being able to talk to the waiters about where they're from got us a few smiles haha. Unfortunately our little Malaysian break ended today. It would have been better to have spent more time here and really got a real taste for the place, but it's not going anywhere and I'm sure we'll be back at some point. We managed to get our passports stamped and get back into Thailand after a crackdown on immigrants making similar visa runs. We're starting to experience a bit more of martial law too as we drive through a few army check points and had our bus randomly pulled over and a few papers checked.